As APA’s LGBTQ and Planning Division winds down the NY Metro Planners4Health grant-funded project, the division has partnered with the Land Use Law Center at Pace University to continue the momentum created through the Planners4Health project. The NY Metro Region Planners4Health project received a grant to help build local capacity for integrating planning and public health. The LGBTQ Division chose to take a leadership role for this grant to ensure that the spectrum of diversity is represented in this initiative. The NY Metro Chapter is serving as a pass-through of the funds to the division for project implementation. A task force with representatives from a variety of professional sectors — including planning, architecture, landscape design, municipal officials, and public health — explored how physical design and the built environment can be used to help create healthier communities. It worked to identify stakeholders interested in creating healthy communities and to share knowledge and resources on building coalitions with public health professionals while ensuring that all sectors of the region’s diverse population were included in the effort. The Land Use Law Center at Pace University became a partner to the task force, providing research to build a toolkit for communities to turn to when looking for ways to build a healthier community. 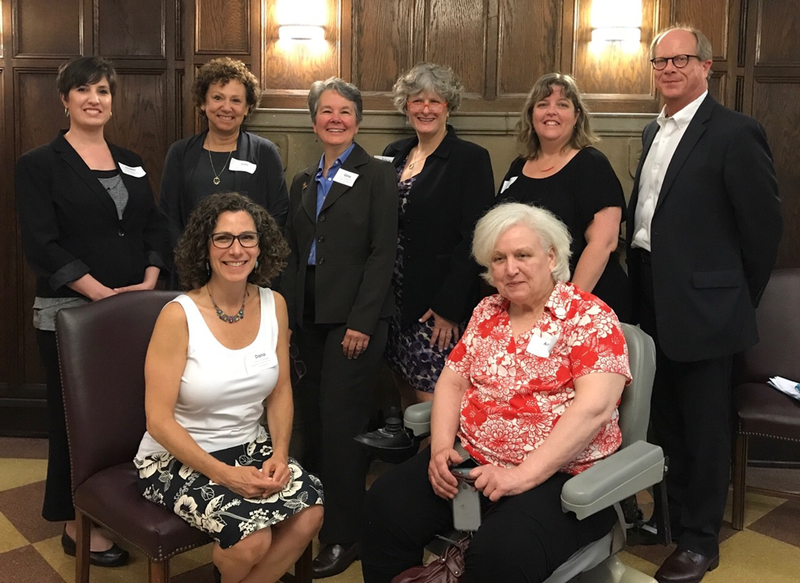 Planners4Health Task Force members from APA's LGBTQ and Planning Division, APA New York Metro Chapter, Open Door Family Medical Center, Town of Ossining, New York, New York Public Health Association, ASLA New York, and Westchester Hudson Valley AIA. Photo by Anna Ricklin. The center also served as host for the NY Metro Planners4Health Creating Healthy Communities Roundtable. That event brought together 85 planners, health professionals, elected officials, and representatives from other built environment sectors to discuss barriers to achieving their objectives, vulnerable populations they have encountered, and successful programs they have implemented and to identify areas of improvement. A common barrier to collaboration cited by roundtable participants was agency isolation — each organization seeing itself as an individual silo. Participants emphasized interagency communication, getting political leadership and first responders involved with health related efforts, and interdepartmental communication within local governments. Lack of funding was an overarching theme for most of the tables. Participants discussed advocacy for grant requirements as an area that needs improvement to ensure projects related to healthier communities are able to move forward, and fundraising techniques their organizations have used, such as the Westchester Public-Private Partnership. In addition to areas of improvement, the table discussions identified multiple opportunities for future action. One of those involves the Land Use Law Center working in a local community (task force member, Town of Ossining) on a health-focused code update with funding from the State’s Climate Smart Communities Program. The Land Use Law Center has applied for a state grant and will implement this project in partnership with the town. All of the NY Metro Planners4Health Task Force members are looking forward to working with other Call to Action partner agencies that they have had professional relationships with in the past and some new ones that have been opened up by opportunities created through the Planners4Health grant. "Working with the Planners4Health Task Force provided me with good ideas about creating opportunities for Ossining residents to make healthier choices," said Dana Levenberg, town supervisor of Ossining and a task force member. "I’m looking forward to continuing to work with the Land Use Law Center and other partners on implementing several of those ideas." This is the second grant the APA NY Metro Chapter has received through the overall Plan4Health initiative. The chapter partnered with the American Public Health Association NYS affiliate for the Live Well Kingston program, a coalition of public and private partners, aiming to encourage active living and healthy eating in various environments throughout the City of Kingston, New York. Top image: Park in Kingston, New York. Photo by Matt Makara. Tracey Corbitt, AICP, is a principal planner for Westchester County, New York, and chair of APA's LGBTQ and Planning Division.